Google's long awaited move into online music streaming has finally arrived in the UK, with the Google Play Music All Access service unlocking itself for official use over here in early August. Google's offering a 30-day free trial to tempt people into giving its Spotify rival a spin, plus there's a discounted monthly subscription fee of £7.99 on offer to listeners who take out a rolling monthly contract right now. That'll increase to £9.99 once the first month is out of the way, taking it bang in line with the £9.99 advert-free premium service offered by established streaming music king Spotify. Whereas Spotify lets you organise your listening through a (clunky) desktop app, Google's All Access system is designed to be accessed online, with a browser-based player for those listening on computers joined by an updated Play Music app for the company's Android-powered smartphones and tablets. With over 24 million users around the world, Spotify is the current leader in the streaming music race. Google Music All Access may be entering late, but its competitive pricing and already large library make it a capable challenger. So which should you buy into? Should you make the switch from Spotify to Google Music? Or wait until Apple gets its own streaming service into gear? This introductory price will rise to £9.99 a month for anyone who registers after September 15 2013. Spotify offers a completely free option, with unlimited desktop/laptop access available for nothing - as long as you don't mind having some of the worst and most grating advertisements created by man popping up between every few tracks to ruin whatever mood music you're currently enjoying. 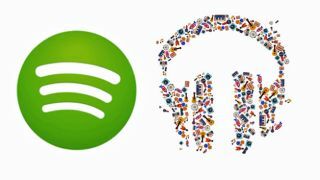 Paying a sub of £4.99 a month removes those adverts, or, for £9.99 a month, you can remove the ads and open up access to listening on the Spotify mobile apps, which bring unlimited streaming to iOS, Android, Blackberry and Windows Phone users. Google Music All Access has no free version at all, although both services offer a 30-day trial period to let users browse the selections, learn the ropes and hopefully like them enough to bother actually paying. At the Google IO announcement on Wednesday representatives claimed it has "millions" of tracks already available on Google Music. It's been reported that Google has negotiated access to music from Sony, Universal and Warner. Spotify is also well established in this area, offering over 20 million tracks. Exploring the two services, the selection seems extremely comparable. We're personally big Spotify users, and searching Google Music, it had all of our most frequently streamed albums. Ultimately, this will become one of, if not the most, important points of comparison for the two services. Remember when Apple broke ground by getting The Beatles on iTunes? Expect a lot of bragging about specific artists from both services. Spotify, for example, recently created a big wave of media buzz when it granted access to the entire Pink Floyd back catalogue to its users. And yes, the prog masters are represented on Google's All Access servers as well. Google Music can be played from a browser on a PC or Mac, and on an Android-based smartphone or tablet through Google's Music app, which recently updated to feature a "radio" button that lets you organise your newly paid for streaming music. Current iPhone users can only access Google's Music and All Access content through the browser, due to lack of a dedicated app, which is quite a large deal-breaker for potential iOS-using All Access customers.